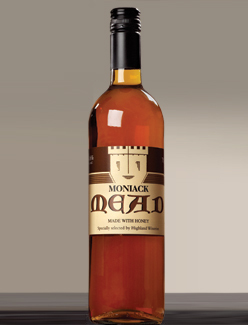 Our famous Moniack Mead is probably the oldest alcoholic drink in the world which has always been drunk on special occasions. We have redesigned the labels using fantastic images from the highlands. Scroll through the pages to see the products with their detailed descriptions and order on line. All available individually or in mixed cases. Alternatively, contact us for more specific information or to find out where your nearest stockist is. Considered the Laird's drink when not fighting, a deep rich classic mead, made from fermented honey. Probably the oldest alcoholic drink in the world which has always been drunk at special occasions, especially during wedding celebrations, hence the name honeymoon. 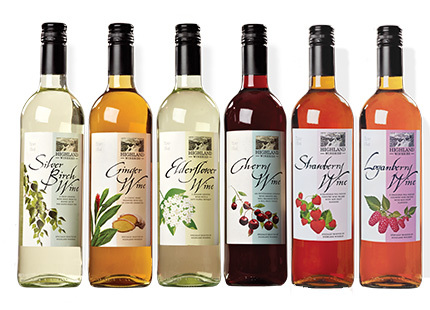 A range of premium fruit wines made from fruits and flowers of the countryside including both lighter, drier wines and full rich red fruit wines. 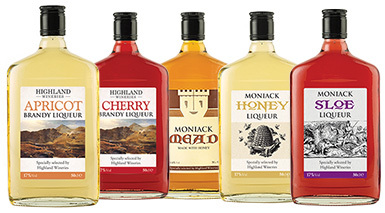 A wonderful range of liqueurs made to original recipes from the Fraser family at Moniack Castle. Full Fruit flavoured, blended with quality spirits. 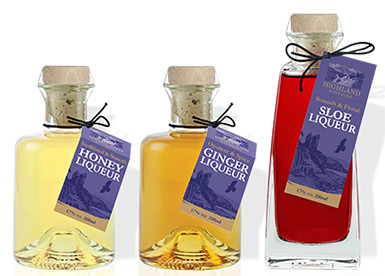 A stunning new range of 3 liqueurs, in unique, high-quality 200ml bottles, each with a beautiful neck label and bow. Together these will look very special on any shelf, with a truly bespoke and eclectic feel to the range.